On 20 September 1917 at 05.40, two regiments, the 3rd and the 4th South African Infantry battalions of the 1st South African Infantry Brigade, left their assembly positions and advanced from Frezenberg Ridge in the direction of Zonnebeke. Zonnebeke is a small village 8km to the east of Ypres, the town that all soldiers who fought in Flanders knew so well. The attack was later officially named the ‘Battle of the Menin Road’ and was part of the so-called ‘Third Ypres Offensive’ in 1917. The South Africans achieved their objective, but the toll was considerable: Of the 2 576 men who went into battle, 1 255 were reported killed, wounded or missing. 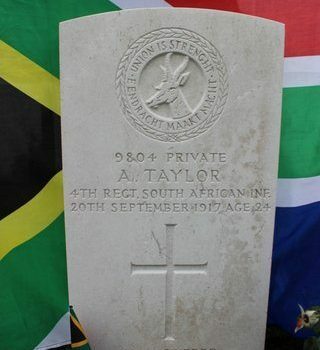 Today, ninety years after the battle, the date 20 September 1917 appears all too often under the laurelled Springbok head emblem, with its motto ‘Union is strength – Eendracht maakt macht’, on the headstones of the South African war graves. This article may be read in full here.